Burai: Hachigyoku no Yuushi Densetsu (ブライ八玉の勇士伝説) is an RPG for the Sega Mega-CD. It was only released in Japan. Main article: Burai: Hachigyoku no Yuushi Densetsu/Magazine articles. 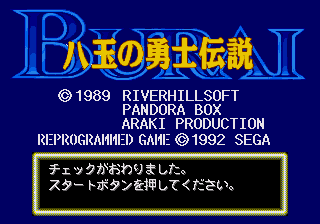 NEC Retro has more information related to Burai: Hachigyoku no Yuushi Densetsu.